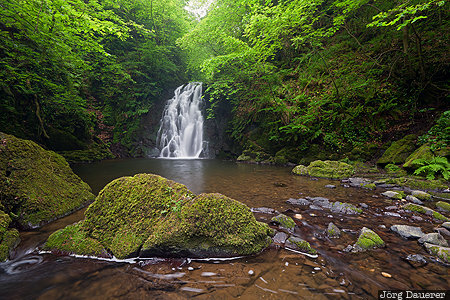 The water of Glenoe Waterfall plummeting down in the glens of Antrim surrounded by green leaves. The Glens of Antrim are in Northern Ireland, United Kingdom. This photo was taken in the afternoon of a cloudy day in June of 2016. This photo was taken with a digital camera.